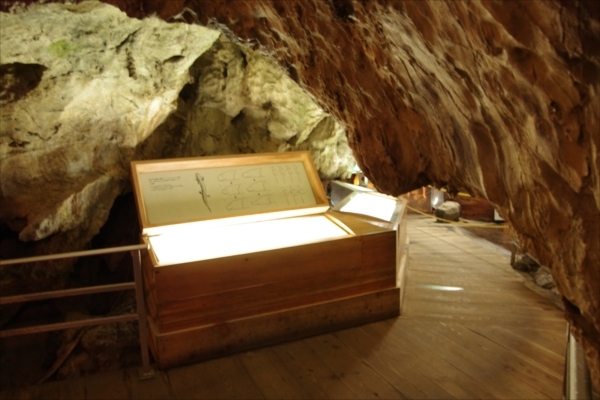 Ryusen Shindo (Ryusen New Cave) was discovered in 1967 during road widening construction in the prefecture. 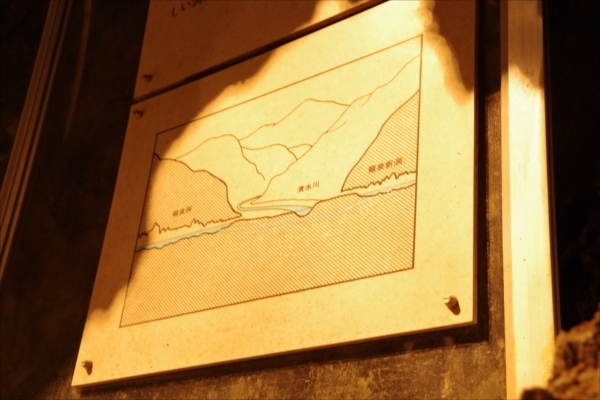 In the past there was a single cave connecting the entire Ryusendo Cave, however erosion by the Shizu River divided the cave into two, so now there is a section on each side of the river. 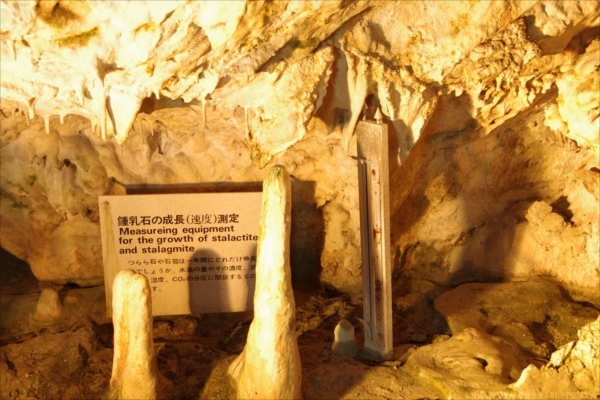 This cave is open to the public as the Ryusen Shindo Science Museum, so-named because of the scientific value of its well-developed stalactites and the water course markings. This is the world’s first “natural cave science museum” where the cave itself is the science museum’s principal exhibit. This is the ticket gate. 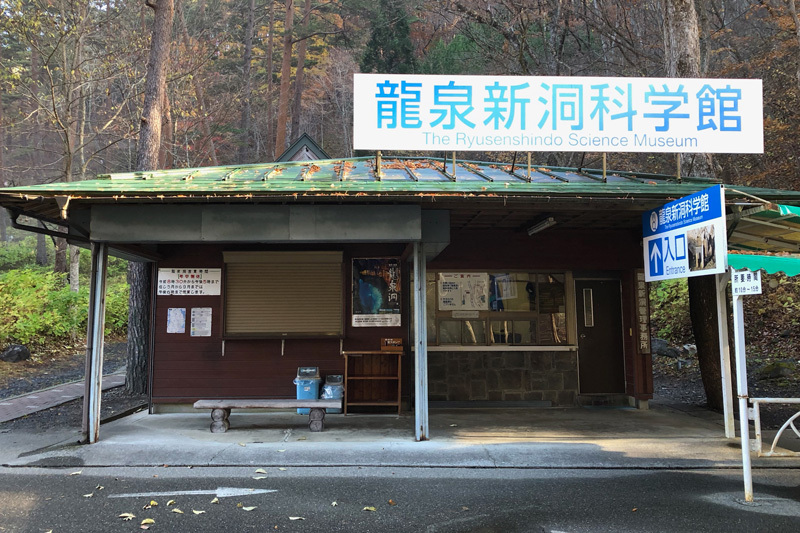 This is where you present your ticket purchased at the Ryusen-do Cave counter. This is the entrance. Following a long descending corridor, you enter the Shindo Science Museum. Chert’ is a kind of sedimentary rock formed from deposits of sand, mud and fossils. 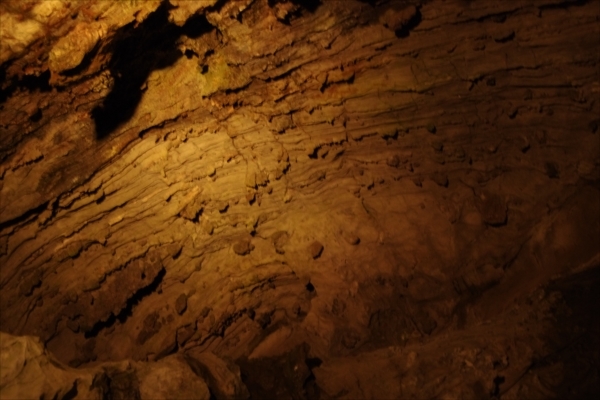 Around Ryusendo Cave, the geological strata consist of of alternating layers of limestone and chert, with portions of the chert which are water-insoluble remain as lumpy or plate-formed projections. Over a long period a stalagmite (which grows upwards like bamboo shoot) and a downward-extending stalactite may join together to form a column and this is called a “stone pillar”. Here we have been measuring the progress of stones which look like becoming stone pillars in the future. 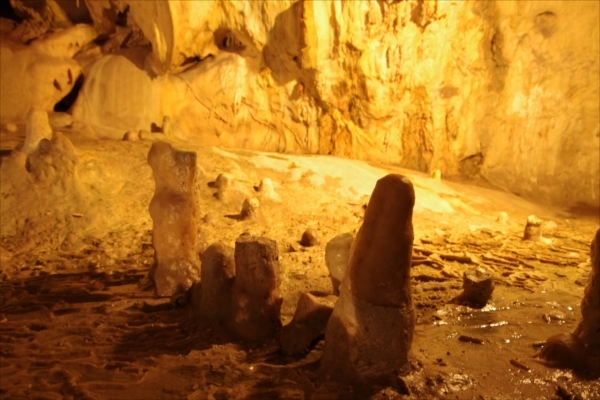 In this area there are many stalagmites, creating a typical cave scene. Many traces of the lives of primitive people have been found here. In this easy-to-understand display you can see how the cave gave shelter from the wind and rain to early people. On the left side further down the route, there is a spot where the surface of water looks just like a mirror under a light. Take a look and marvel at the mysterious hues produced by the pure water. 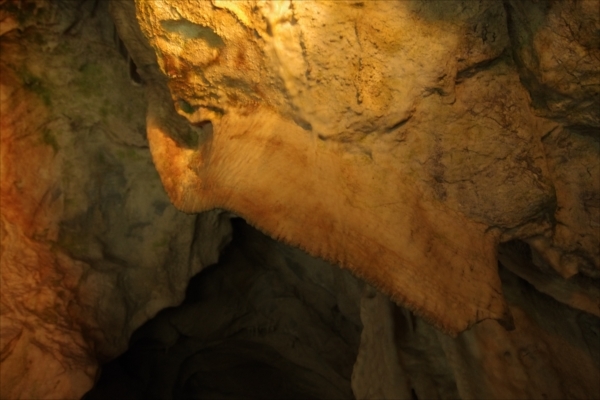 To preserve this scientifically valuable cave for future ages in a close-to-natural state, we have placed off-limits the cave’s deep interior, which is rich with stalactites. The ”Clastic canopy (flowstone canopy)” is made from layers of flowstone that extend out over open space. 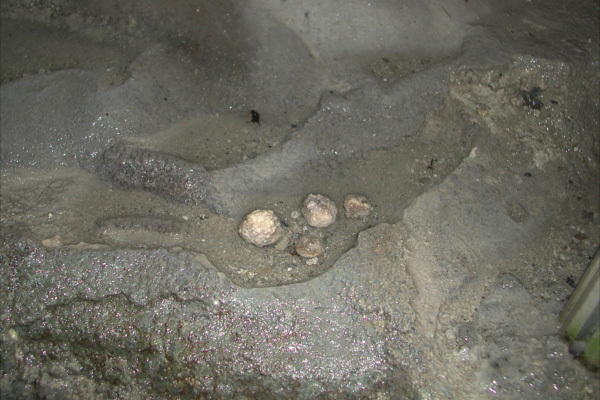 Initially, where the sediment (gravel) on the dried-up cave floor was covered with flowstone over the years, the water started running again, and washed away the gravel, leaving behind the flowstone shelf or canopy. The soda straw grows from water dripping from a small hole in the ceiling. Thinly crystallized calcium carbonate gradually forms a hollow tube. 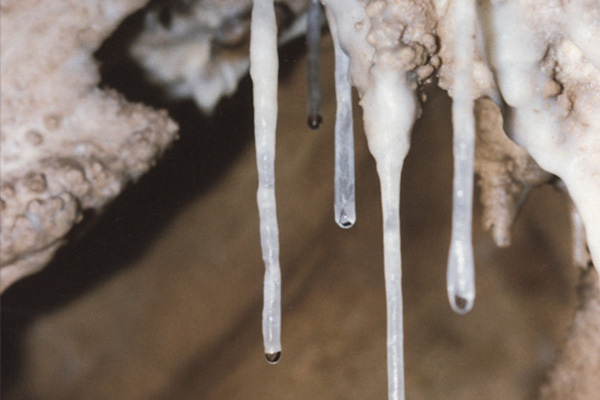 This is a different form of stalactite and is found in a shallow puddle where water drips constantly. It is a white ball of about 1-3 mm in size with a shiny surface, and thus called a ”cave pearl”. It is thought to grow by rolling like a snowball. Bacon is a stalactite drapery with stripes within the sheet, formed when water drips flow diagonally over the sloping wall. Depending on the constituents of the downward flow at the time, different color layers form and these look like bacon stripes, hence the name. A sheet-like stalactite which forms in a similar way, this one is called, ”drapery (curtain)”. 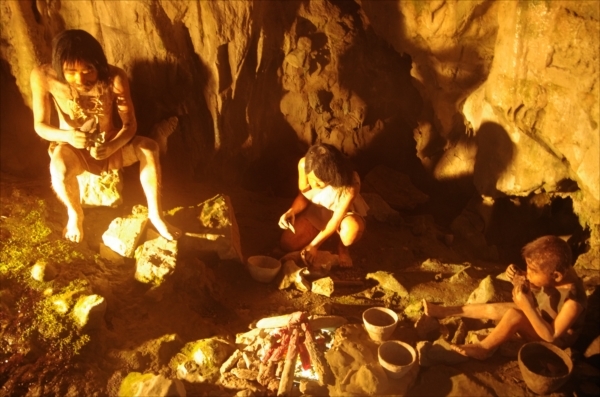 Within this cave, many ancient bones of animals and the combs fashioned from bone have been excavated, along with earthenware and stoneware of the Jomon period. This tells us that a long time ago early man lived in this cave. The primitive inhabitants used cave like these with good access to water as a natural abode offering protection from wind and rain, and also the cold. The moose (or Elk) is a herbivorous mammal that lives in the north, such as present-day Siberia. The moose, along with the mammoth, etc., are known to have entered the Japanese archipelago across the land-bridge which connected to the Asian continent in the Ice Age when sea levels were low. 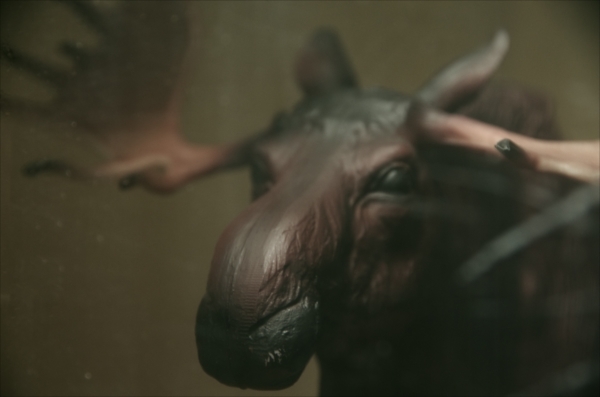 Later the moose became extinct in the Japanese islands. Although introduced in the section, ”Today’s cave inhabitants”, naturally, no live moose inhabits today’s Ryusen Shindo Cave! 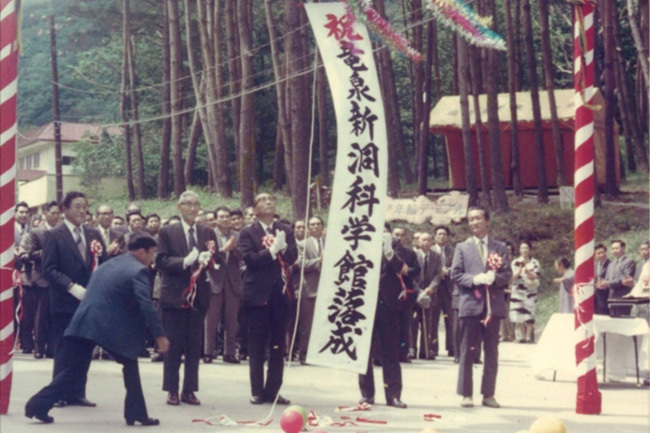 The Shindo Science Museum opened in 1975.Because it was found later than Ryusendo Cave, it was named ”Shindo (a new cave)”. 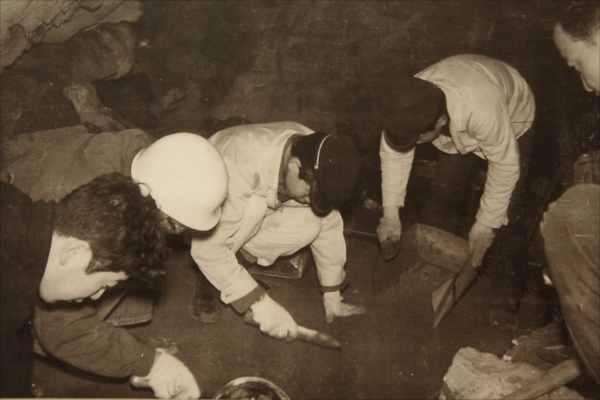 In 1968 (Showa 43) the Shindo Archaeological Site Investigation Team carried out an excavational investigation of the Ryusen Shindo site, which had been discovered by the student members of the regional study group of the Iwaizumi high school. Excavated artefacts included Mumon (patternless) earthenware, stone implements and bone needles belonging to the early Jomon period. The stone axes made by the abrasion-cutting and polishing method are said to be the oldest examples of such excavated specimens of our country. 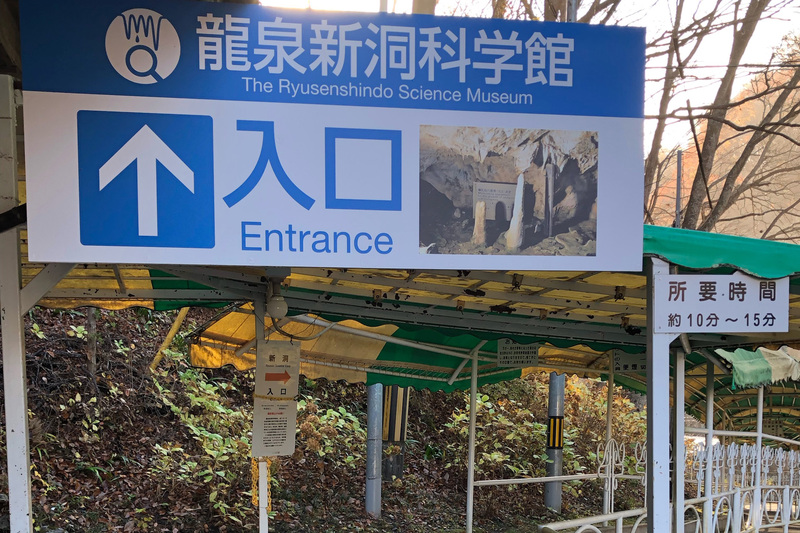 A survey found another route followed by the water flowing from Ryusendo Cave and out to the Ryusen Shindo Schience Museum, and this runs underneath the Shiizu River, which itself passes by the front of Ryusendo Cave. 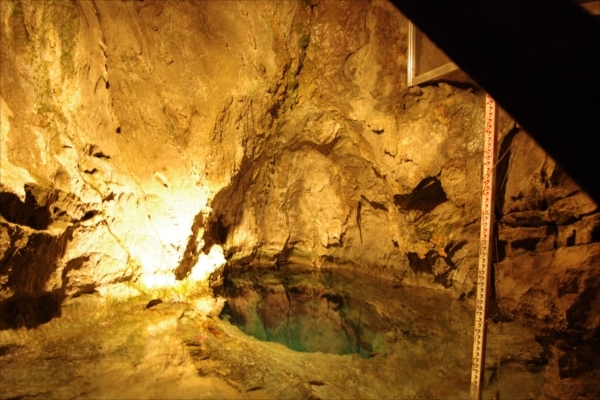 The water from the vicinity of the Kame-iwa (Turtle Rock) in Ryusendo Cave reached the spring in Ryusen Shindo Cave in approx. 50 min. 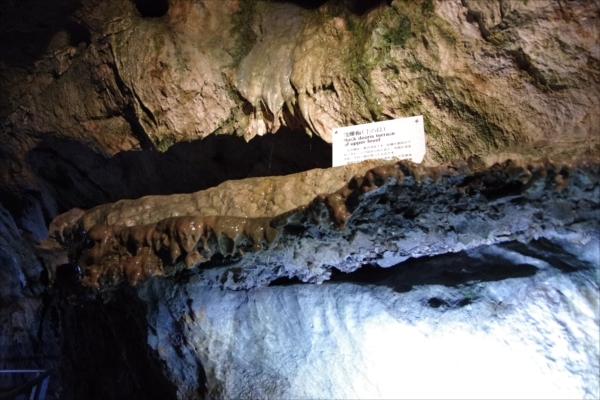 To find out where the water out of Ryusen Shindo Cave flows to, an experimental investigation added a dye to the water, (the same as is used in bath salts). It was found that the flowing colored water disappeared into the ground water of the neighboring factory, but the flow route from that point on remains a mystery to this day. 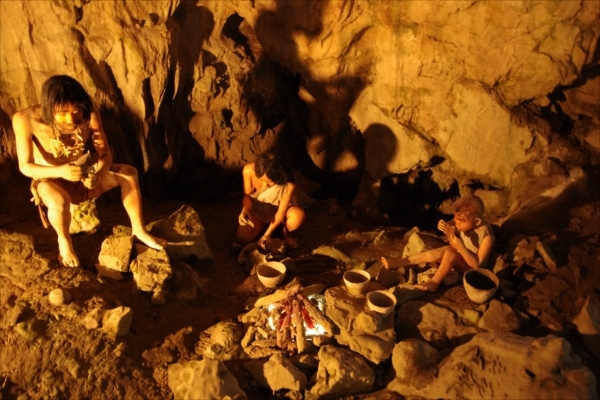 Inside the cave, we display excavated earthenware, stone implements and specimens of academic interest excavated here. 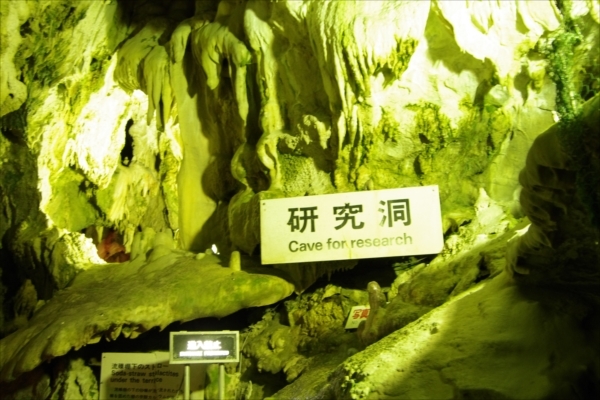 This is the world’s first ”natural cave science museum” where the cave itself is the science museum’s principal exhibit.